Paragon City: The City of Heroes! The only place in the world where the hero-to-problem ratio is almost one-to-one. If you need a hero in this city, you just have to look around the corner. All issues are in PDF format. You must have a PDF reader such as Adobe Acrobat to view these files. Click on the (read) link to view the comics from MMO Comic Index, or the (alt) link to view from DeviantART. A text-only story describing the events that led to the three “Guardian Exiles” to arrive in Paragon City and how they learned about their origins. The first of the “Guardian Exiles” stories, taking place several months after Issue #0. Galatea Powers discusses some of the recent changes in her personal life and how they tie into her life as a superhero. 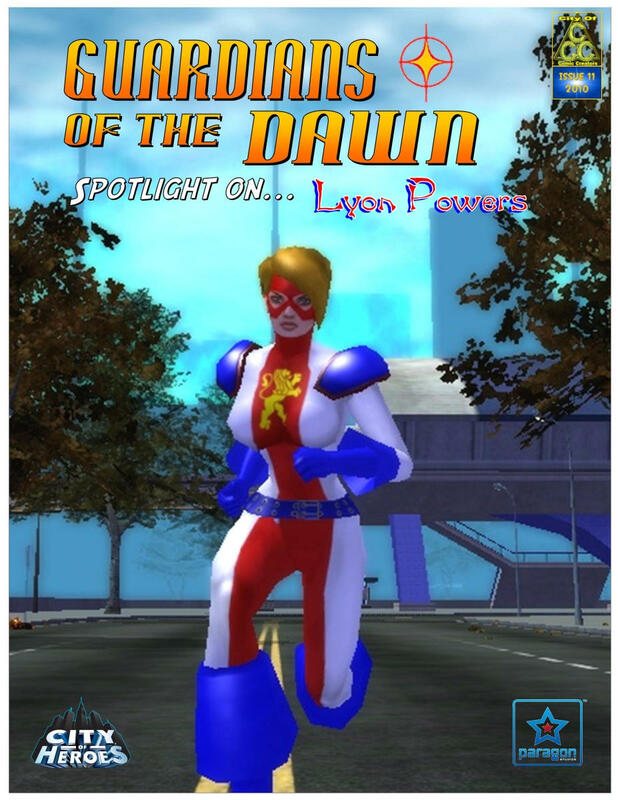 Plus the first appearance of Lyon Powers. The second of the three “Guardian Exiles” stories. 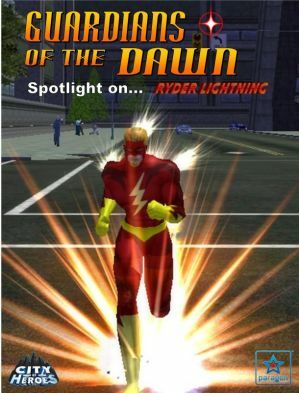 Ryder Lightning discusses his origins as well as the secret to his powers and the “Crisis Event” that brought them over. Plus more on the arrival of Lyon Powers and her quest to find Galatea Powers. The third and final part of the “Guardian Exiles” stories. MidKnight X explains why he operates as a street vigilante and what makes him so dangerous. 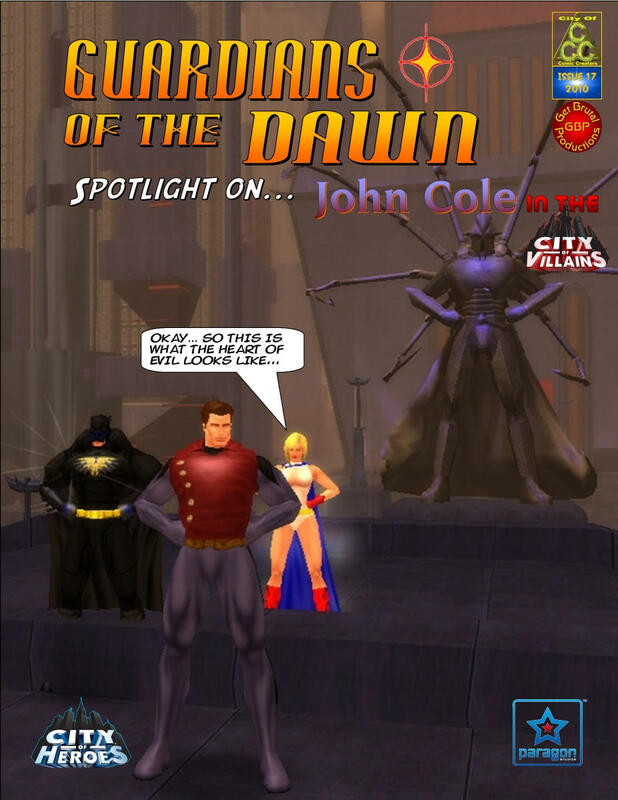 Plus, in the middle of the Halloween Event, Galatea Powers meets up with Lyon Powers to clear the air and to discuss how the “Exiles” got their powers in their universe. Captain Paragonna’s past catches up to her, and somoene is threatening to expose her identity to the world. Who is bringing up bad memories of a life no longer hers? And is there anything the Captain can do about it? Once wrongly accused of a crime he didn’t commit, the Libertarian Avenger now strikes out to keep the people safe from the worst kind of criminal around: the criminals in government. When he discovered the person who did the crime that he was once accused of doing, he has to move fast to save the life of another innocent person. And this time, he will need help! Will this monster be the key to going after the REAL mastermind? 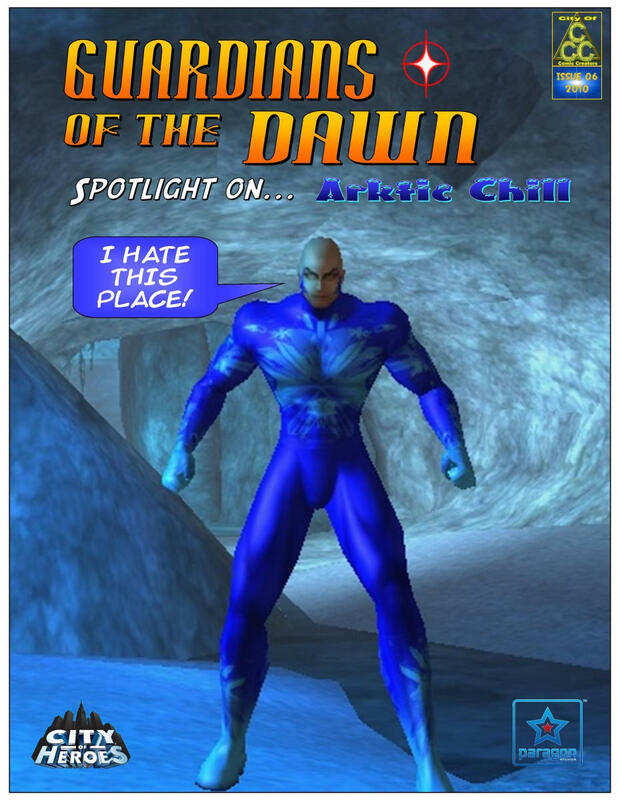 A mutant who hates his mutation, Arktic Chill has his own reasons for being a registered superhero. Teaming up with an ex-firefighter with his own problems, the two of them must find out who is behind the series of arson attacks in Paragon City. Part 1 of “Limelight”. 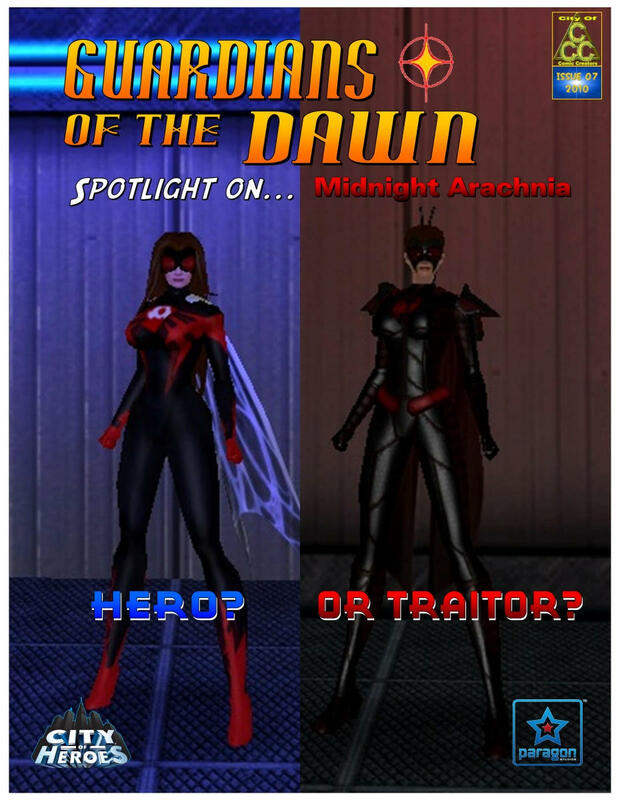 Is the co-founder and co-leader of the Guardians of the Dawn an Arachnos spy? A traitor to the United States? Or is she just the first victim of Shadowborn’s new campaign to neutralize the team? 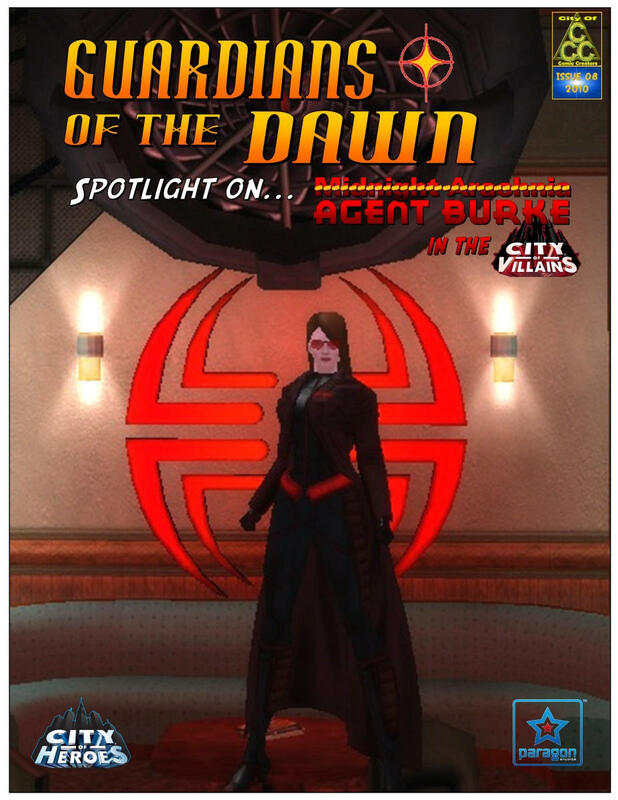 Part 2 of the “Limelight” story as Midnight Arachnia returns to the Rogue Isles (aka the “City of Villains“) in her guise as “Agent Burke” to unlock the secrets of her past and her connection to Arachnos. Meanwhile, her teammates struggle to clear her name and restore the group’s reputation. Following the two-part “Limelight” story, Coeur Du Feu must retrieve a stolen charm that has a link similar to her own mystical powers, and she must find it before the Cabal does, and before lives are lost. Paragon City’s most controversial talking head is back on the air, and this time he wants to put Lyon Powers into the spotlight. But he’s not the only one with the young British superhero on his mind. A member of the Guardians of the Dawn DIES! And that is only the start of the story! Bear witness to birth of one of the most powerful members of the Guardians of the Dawn. Following the events from Issue 12, Daybright’s very existence has potentially dire consequences for herself and those who associate with her. 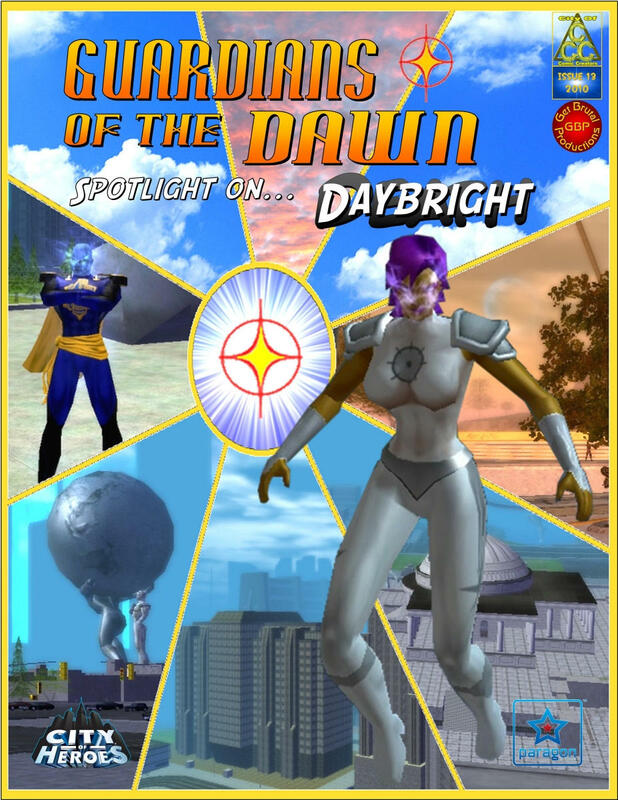 Can the Guardians of the Dawn stop an all-out conflict with the human-alien hybrids that work for Paragon City’s police force? And what is her connection to a hero considered dead from the Blue King Comics “City of Heroes” series? All hail the once and former King of Earth! The Guardians are under new leadership; one that promises to no longer chase shadows. But what secrets does he himself hold? Omega Shift must solve the mystery behind the attack on Paragon City’s police chief. But how is she connected to the attacker? And what secret does she hide? To keep their secrets from being sold to the highest bidder, the Guardians have to travel to the Rogue Isles and work with members of The Libra Order, and with someone with a very familiar last name. What is his connection to Paragon City’s most iconic family? The shocking events of Issue 17 have implications for the future of humanity as the future version of Galatea Powers recounts what happened to the Guardians of the Dawn, and for Earth, after she was teleported against her will to Ouroboros. See the story of “The Last Guardian of Earth”! “Time And Changes” Phase 2! Since his arrival in the Paraverse, Icon Powers has remained in the shadows of the other Guardians, providing support and advice when possible, but leaving the media attention to his cousin, Galatea. But with Galatea Powers missing and Daybright considered dead, Icon is forced to return to the public limelight. Yet this older and seasoned member of the Powers family holds a deep family secret about his cousin, and it is one that would spell doom for Paragon City if it is revealed. 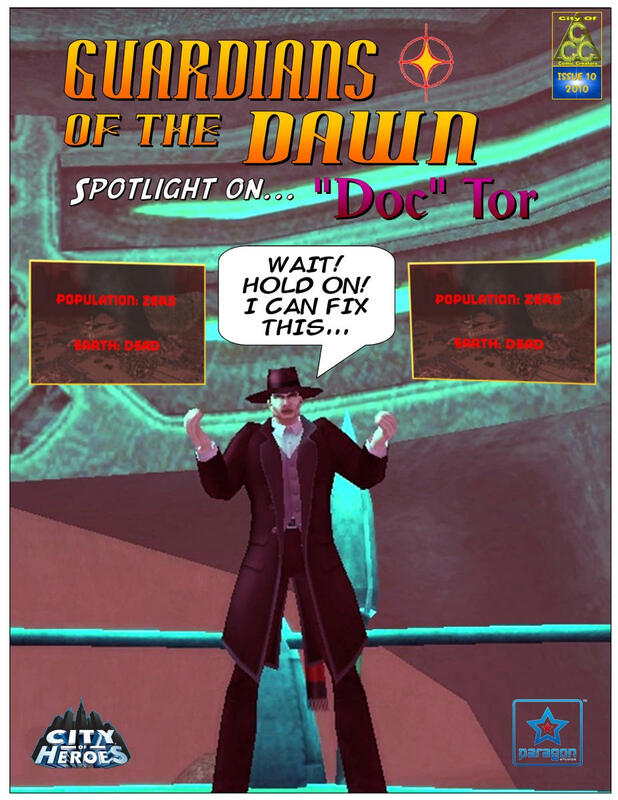 Plus, more about Daybright’s new mission in Limbo, and “Doc” Tor pays a visit to someone he dreads seeing! “Time And Changes” Phase 3! His presence has been felt since Issue #0. His actions played a role in creating the “Guardian Exiles”. He has been the silent partner in the sabotage of the Guardians of the Dawn and is personally responsible for the “death” of Daybright. He is “Doc” Tor’s nemesis from his Time Manipulator days. He is ALOR: the alpha and the omega of the original gods of the universe! See his story unfold as he confronts Citadel of the Freedom Phalanx, and as Daybright finds out more from both Tainted Eve and Libra about her role in the “Great Battle”. “Time And Changes” Phase 4! It’s been talked about since the start of the series. It’s been seen only briefly. 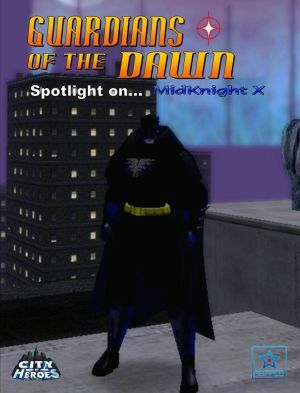 But now see THE EVENT that brought Galatea Powers, MidKnight X, and Ryder Lightning to the City of Heroes in 2007! You think you know what happened? Don’t be too sure! Plus MidKnight X breaks into the Rocinante Group, the heart of Shadowborn! “Time And Changes” Phase 5! Following the “Time and Changes” storyline, Galatea Powers has returned to Paragon City from her months away as an unwilling “guest” of Ouroboros, but she is clearly not the same woman that people remember her to be. What is happening to her will change her life forever. Agent Stevie Walker-Rodgers, still suspended from acting as Captain Paragonna, searches for her predecessor. Plus, the quest to fill the vacated District Attorney position heats up with potential candidates lining up, including one that you won’t believe! 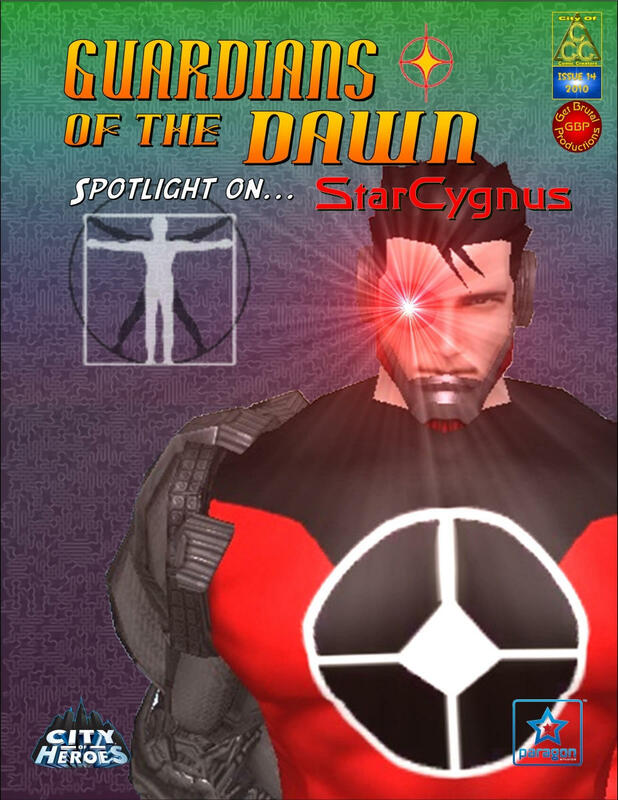 With several members of the Guardians of the Dawn either on assignment, on vacation, or on leave, a certain idea is floated about to boost up the ranks. Join Whyspera as she finds out that sometimes having open tryouts for members is not a good idea. FINAL ISSUE! MidKnight X is on the hunt in Europe… first for the legendary elusive investigator Shodden Freud, and then to confront Simon Barrister, the man who stole the secrets of the Guardians. Find out the devastating secret that could cost one Guardian their life! 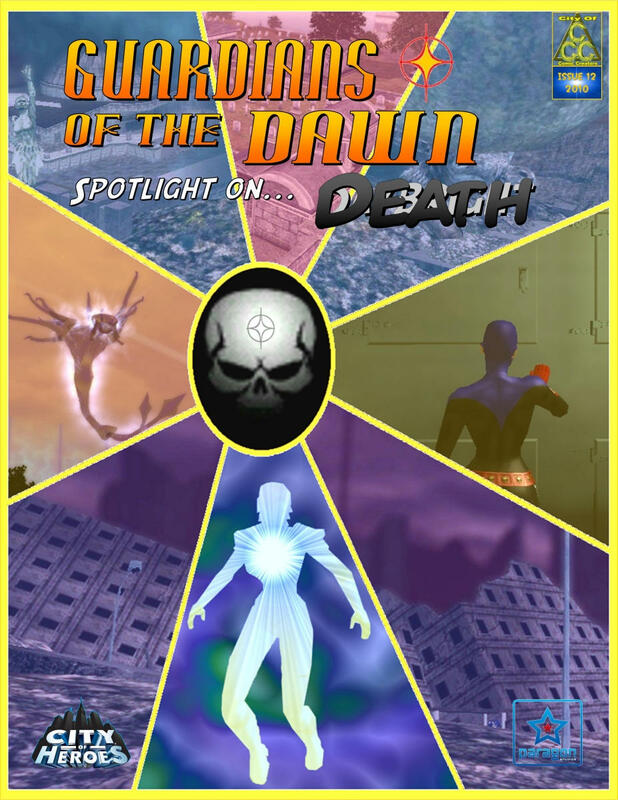 What happened to the Guardians of the Dawn? And what is in store for them? The fate and future of the Guardians both as a group and as heroes will be revealed here! 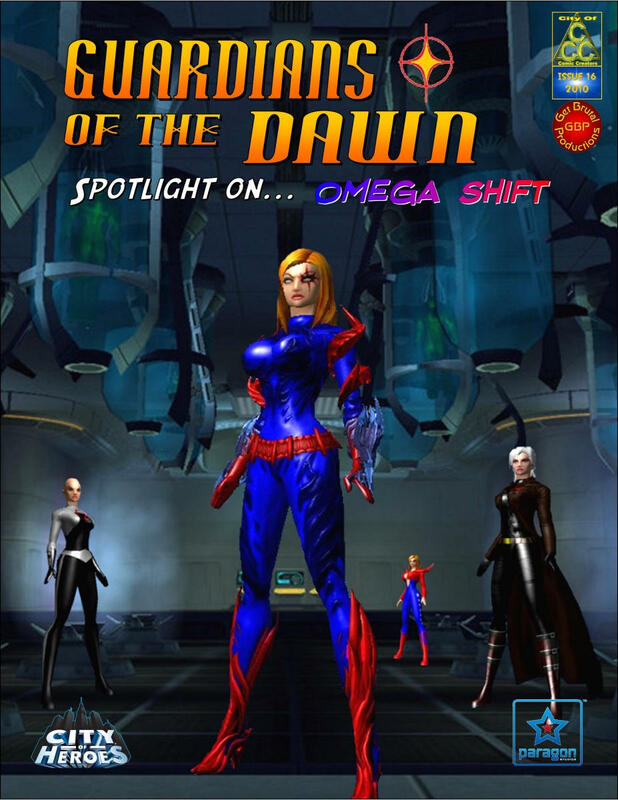 “Guardians of the Dawn Spotlight” is created using original characters in the City of Heroes Multiplayer Online Roleplaying Game. Copyright © 2004-2012. 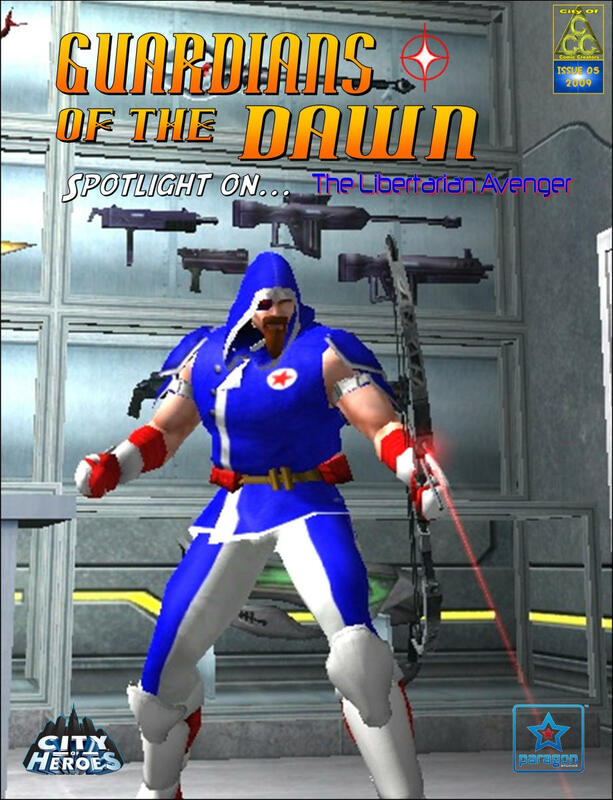 This story is an independent not-for-profit derivative work of the City of Heroes Game. All original rights are reserved by NCSoft and Paragon Studios. NCSoft, the interlocking NC logo, Paragon Studios, City of Heroes, City of Villains, and all associated logos and designs are trademarks or registered trademarks of NCSoft Corporation and Paragon Studios. Cryptic Studios is a trademark of Cryptic Studios, Inc. All other trademarks are property of their respective owners.